Have you purchased something that you had to return because it didn’t fit? Maybe you don’t need that fifth Crock Pot you got for Christmas and want to take it back to the store. My guest this week, Ellen Roseman, is a personal finance writer and consumer advocate. She guides us through the often murky world of retail shopping returns. 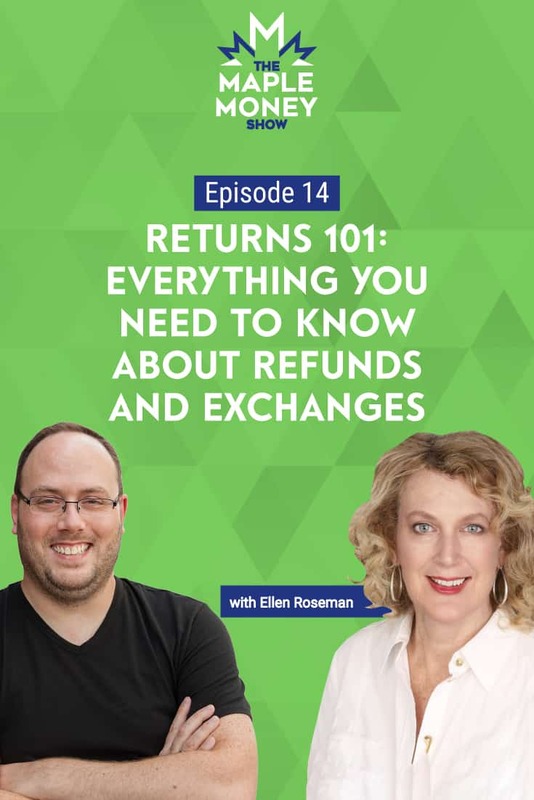 Ellen explains why it’s important to ask up front about a store’s return policy, to make sure you fully understand it. Did you know? If you can’t get a refund from the retailer or manufacturer, try going back to your credit card company. Ellen and I discuss how credit card companies often provide additional protection to consumers through extended warranties and zero liability policies. As a result, you may be better off paying for certain items with a credit card as opposed to debit, providing you are paying the balance in full each month, and avoiding the high interest charges. Ellen provides us with a number of helpful tips. For example, when returning an item with a gift receipt, make sure you are receiving a refund of the original purchase price, not the current price, which can often be lower by the time it’s returned. Our sponsor this week is Wealthsimple. Are you a socially responsible investor? If so, Wealthsimple can help you build a portfolio that focuses on low carbon, clean tech, human rights, and the environment. Get started with Socially Responsible Investing (SRI) by visiting Wealthsimple today! Do consumers have a right to a refund or exchange if a product is defective? A retailer has a legal responsibility as the intermediary between the consumer and manufacturer. Stores have no obligation to notify you verbally of their refund policy, don’t be afraid to ask about it. Many retailers try to keep details of their return policy under wraps. What makes Costco’s return policy so great. Why paying with a credit card can be better than with debit. Places to look for a store’s return policy. Many industries are notorious for having poor return policies.